Some history from our Past! Part of the United Benefice of Brent Knoll, East Brent and Lympsham. 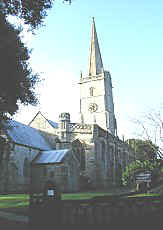 Worship is rotated between the three worship centres of the Benefice - St Michael's (Brent Knoll), St Mary's (East Brent) and St Christopher's (Lympsham). Where and when worship is can be found in the East Brent and Rooksbridge Community Magazine, from the Church Office, and the Church Porch notice boards.